Headbands and hair accessories have been a big trend for a while and we’re totally on board — to an extent. A colorful hair clip, a textured headband, or a sparkly barrette can all add some extra oomph to your outfit. But what about flowers that look like they’re going to eat your head (talking to you Taylor Swift) or giant hair bows made out of, yep, hair (cough, cough, Lady Gaga). Turns out, not all hair accessories are good accessories, although Hollywood hasn’t quite caught on to this. To help explain the fine line between cute and what-the-heck-was-she-thinking? !, we’ve created this little chart below — a hair accessories spectrum if you will. At the top, we’ve got some pretty dang cute looks. Nicole Richie’s gold headband (part of her own collection) strikes the perfect balance between hippie and glam and we’d love to steal Diane Kruger’s jeweled hair clip for our next big event. However, Mischa Barton’s garland (which sort of makes her look like a flower girl at a wedding, no?) and Katherine Jenkins’ peacock feather strapped to her head are certainly not for the timid. But any girl with some guts could probably pull them off. Venturing into the land of the confused is Kelly Osbourne. I know the ’80s are making a comeback, but that doesn’t mean we should all plop floppy bows on our heads and pretend they’re cool, OK? And Paris Hilton’s fringed purple headband could have been cute — if it didn’t stick out a good three inches off her head. Sigh. Then there’s the celebrities that either think of hair accessories like performance art — Lady Gaga, for example — or perhaps they don’t have a voice of reason around them to gently imply that giant, lime green plumage is best kept to jungle birds. Yes, that means you, Sarah Jessica Parker. And while we’re at it, giant black mesh hats aren’t exactly "sane" either. What do you think? 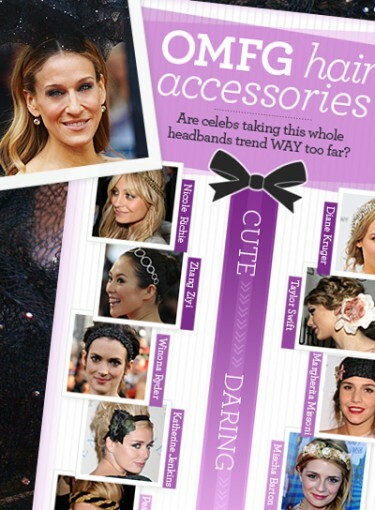 Did we put any of these celebrities’ hair accessories in the wrong category? Would you actually wear any of these looks (outside of Zhang Ziyi’s extremely wearable silver headband)? Inquiring minds — er, that would be me — want to know.